Michigan hit the road this weekend for two games at Ohio State and while the games didn't have the intensity of a UM-OSU football game, the Wolverines played well enough to earn a split. Friday night, Michigan never got better than a 2-2 tie and fell by a 5-3 count. Luke Glendening and Chris Brown tied the game in the second period, but OSU scored three in the third with a Carl Hagelin goal late being UM's third marker. Bryan Hogan finished with 15 saves in goal for the Wolverines. "I thought we had the momentum in the game," Michigan head coach Red Berenson said. "You've got to capitalize on your chances and I don't think we did that tonight. We did have enough chances to win the game, but when you're playing from behind it's harder to score. I thought we had a good game. We have to play better, obviously. We gave up goals we can't give up to a team like that." 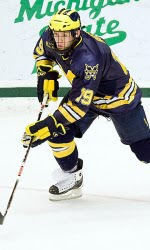 Then last night, Michigan captain Chris Summers and Matt Rust (pictured) scored power-play goals as UM held on for a 2-1 win. Hogan allowed just an extra-attacker goal in the dying seconds of regulation to finish with 26 saves. "Any time you get the first goal of the game, especially in the first period, the momentum is going your way," Summers said. "That's what we've talked about all year. That's what we always talk about every year - make sure we go out and get that first goal that might change the entire game, whether it be the morale of the forwards and making sure they're burying their chances or giving the defense more confidence to stay up and play a tight gap." The Wolverines (8-8-0, 4-6-0-0 CCHA) have a staggered home-and-home series with Notre Dame next weekend. U-M hosts the Fighting Irish at Yost Ice Arena on Friday, while the series moves to South Bend on Sunday. These were two of the most bizarre games I think I've witnessed in a long time. Ohio State ended up winning on Friday night strictly from puck luck as everything they touched seemed to find the back of the net although they were outplayed for the majority of the game and outshot by 25 shots. Saturday would have been a shutout if not for the referee never learning to pick up his skates when the puck comes his way. Michigan had a breakaway at an empty net 3-0 winner and the puck ended up getting mired in the official's skates leading to an odd man rush the other way and ultimately the lone goal.